Rediff.com » News » Will BJP return with a full majority? Will BJP return with a full majority? 'The 2019 election could well become a referendum on Narendra Damodardas Modi, in which case the BJP could prove all its critics wrong,' notes T C A Srinivasa-Raghavan. A couple of weeks ago, a very senior member of the Congress publicly said the BJP would lose 135 seats in the 2019 general election. I thought this was a very precise number, based possibly on some internal estimates of the party. He did not, however, say how many the Congress would win. Should this happen -- and that huge a fall seems unlikely -- the BJP will come down to 147 seats from the 282 it won in 2014, and 133 from its current position of 268 in the Lok Sabha. This is very close to the 138 seats it had won in 2004. Meanwhile, the Congress itself does not believe it will get more than 125 seats, which is around three times what it won in 2014. Less hopeful and more realistic estimates place its tally at around 100. That will be enough for it to cry victory and hail Rahul Gandhi as a champion. If we take the most optimistic estimates of the Congress -- BJP 133, Congress 125 -- who will the President invite to form the next government? This question has only one answer. Then, whoever the prime minister is, we will have to see if he gets 1996'd. Remember how Atal Bihari Vajpayee was unseated after just 13 days in office? That too could happen if the BJP loses more than 100 seats. Also if, as seems more likely, the BJP and the Congress between them manage to win only around 280 seats, the rest of the parties will account for the remaining 264 seats. In 2014 BJP+Congress was 326 seats, which left the rest with 218. So regardless of who leads the next government, we are going to have a weak or a very weak government after five years of a very strong one. For this not to happen, the party that leads the next government will have to win at least 210 seats because it is only then that its foundational weakness diminishes sufficiently. We have the experiences of 1996, 1998, 1999 and 2004 as witness. Each of these governments was hostage to regional parties. True, the Congress won 206 seats in 2009 and was less of a hostage than in 2004, where it had won 145. But it squandered the opportunity. Politics in India is about two things only -- 90 per cent of it is about social policies and only 10 per cent is about economic policies. And, most regrettably, 90 per cent of the 90 per cent is about caste and community while 90 per cent of the remaining 10 per cent is about inflation. It is also true that for their own reasons both the BJP and the Congress have avoided using caste as their main driver. The BJP has tried to unite the Hindus and the Congress has tried to unite the minorities. This is perhaps the only good thing they have in common. On bad things they are peas of a pod. Take out the family from the Congress and the RSS from the BJP and the two could unite. Thus, after 2004, the Congress focused on community -- recall the 2015 A K Antony report, which said it had bent too far in favour of Muslims -- and neglected inflation and caste. The BJP, on the other hand, has always focused on inflation and community while neglecting caste. The result has been a walkover for the caste-based parties. These could well account for around 50 per cent of the seats in the next Lok Sabha, which is likely to be the real bad news of the 2019 election. Experience since 1989 shows that whenever the central government is highly dependent on caste-based parties, national governance goes for a toss because the domestic agenda is driven by very narrow issues. This, I fear, is what we are in for even if the BJP manages to keep its losses down to 80 to 100 seats. But if you speak to its functionaries, they tell you it is expecting to keep its losses down to just 50 seats by making up in states where it had not done well before. But that may well turn out to be just a fond hope. There is finally the Modi factor, down perhaps but not out. 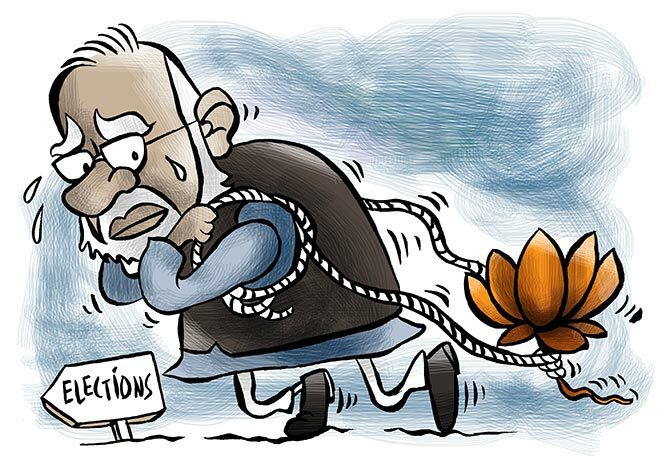 In that sense, the 2019 election could well become a referendum on Narendra Damodardas Modi, in which case the BJP could prove all its critics wrong.